Combined with a world class curriculum that incorporates industry-relevant courses in tandem with real-world scenarios and projects. INTI graduates are highly employable and empowered to make a positive difference from day one. Compared to other universities, INTI provides an affordable UK degree with four different majors including Journalism, New Media Publishing, Broadcasting and Media Culture. These majors cater to the needs of the future because media does not solely rely on a single platform – but different platforms that require transferable knowledge. The up-to-date facilities that are available at INTI enabled me to gain hands-on experience. Lecturers here are from various industries with ample knowledge. They are highly-motivated and willing to share their experiences so that students can be equipped with practical knowledge. I’m glad that I chose to study at INTI. 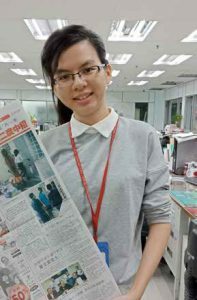 I have a strong interest in news-writing and meeting different people, and this interest developed in high school. Reading newspapers has been a daily routine and made me who I am today. Before I started my internship or entered the working world, the INTI staff from Career Services were always ready to assist me. They provided mock interviews, organised career fairs and workshops for resumewriting. Once I graduated, I was fully equipped with the knowledge I needed to score my dream job as a journalist. Since my diploma, I dreamed of becoming a journalist to help the marginalized and underprivileged communities. I want to provide them with a platform to voice their concerns and use my knowledge as well as experiences to assist them. I now have the opportunity to meet people from all walks of life, and this has enhanced my lifestyle as well as working experience. I believe that a good leader is creative and flexible, as one needs to produce original work and be able to adapt to different circumstances. A good leader must also have the ability to deal with different people, be willing to lead by example, and be impartial. Life lessons are important as they are key to adapting to our ever-changing environment. Mass media has evolved and continues to, so students must be versatile in many other fields like photography and video editing on top of their journalist skills, in order to fund success. 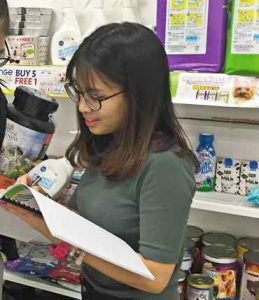 I chose to pursue a Mass Communication degree in INTI because the programme offers practical models, that expose students to industry-like experiences. 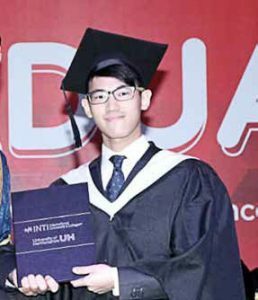 My experience at INTI also encouraged me to take on innovative ways of learning and explore online resources, instead of waiting for the lecturer to provide us with them. My urge to pursue a career in digital marketing started through the Google Ignite programmes and classes like ‘Advertising’, ‘Online Journalism’ and ‘Digital Media’. Through these experiences, I gradually realised I had an avid interest towards digital marketing. I believe that a successful leader has integrity, is sociable and is always willing to listen. I overcame my struggles by always reminding myself to try my best, and to not have any regrets. In the words of Jack Ma, ‘If you don’t give up, you will still have a chance. Giving up is the greatest failure.’ My advice to students is to find out what you’re really passionate about and to pursue it without any regrets. Be confident, humble, and never stop learning. My juniors and colleagues often ask for my opinion on where to study and my answer remains the same – INTI, simply because I am ever grateful to the institution for my studies. INTI has provided me with a good platform to gain knowledge and prepared me well for industry-related experiences. The support and encouragement I received throughout the whole journey of my bachelor’s degree from the lecturers and my fellow classmates are what helped me push through, and the reason why I entered the working world industry ready. Marketing Communications was new to me as it required communication skills as well as marketing skills, so I wanted to give it a try. The tasks given were things I had never done before, so they were both interesting and challenging. When I couldn’t secure an internship, I got severely unmotivated as my friends have already secured their internship placements. I decided to continue sending out resumes and fortunately, Ecopet Marketing Sdn Bhd got back to me. I currently work for them, and I am grateful for being granted the opportunity. Successful leaders need to be patient, wise, and not quick to give up. My advice to fellow students would be, being sure of what you want to pursue, then plan for it accordingly. Be organised and self-disciplined because 24 hours a day flies by really fast. Utilise your time wisely, and find a balance for it with time for family or personal matters, and sleep. Never give up, never stop learning and never stop brushing up on skills, as they might be useful in the future. The 3+0 BA (HONS) Mass Communications, offered in collaboration with the University of Hertfordshire, UK offers students an opportunity to explore possibilities in Film, Journalism, Media Cultures and New Media Publishing. Communicating effectively with co-workers, clients and the public requires expertise in oral, written and visual communications. Students are taught to understand the characteristics and intricacies of media’s role in society, in order to convey messages effectively, using critical thinking skills. This Diploma in Mass Communication is a broad-based diploma course that covers Public Relations, Advertising, TV Production, Journalism, Media Planning and Marketing. The Foundation in Arts programme prepares students to think creatively and effectively communicate ideas via various media.